I have a love/hate relationship with the Hitwoman series. I love the situations Maggie finds herself in, the animals, the humor and the craziness, but I hate that each one ends and I have to wait for the next adventure. I know JB Lynn wouldn’t want me to recommend this but it’s almost better if you wait until ALL of them come out and read them all at once. The problem is, I don’t know how many are planned so you could be waiting years and that just isn’t a good idea. In The Hitwoman and the Neurotic Witness, Maggie, the heroine of the story and the hitwoman is told by her mob boss to investigate to find out who bombed her apartment building. She doesn’t really want to do this because she has enough craziness in her life and she would really like a break from crazy, but you don’t say no to a mob boss. Patrick, her murder mentor who is also a police detective warns her to stay out of this and not to investigate. Now what? Who does she listen to? 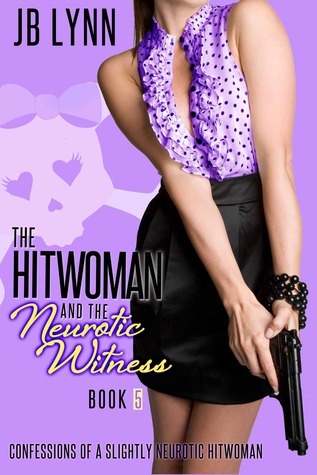 I found The Hitwoman and the Neurotic Witness to be just as fun and entertaining as the other books in the series. Just when I wonder what Maggie could get into, there is another adventure that leaves me asking myself how JB can come up with this stuff? I mean, really? The scenes are one of a kind and laugh out loud funny. The Hitwoman and the Neurotic Witness is so engaging from the beginning that before you know it, the story is over and you are wishing for more! I love the snarky comments from God (the lizard) and Piss (the cat) and the excitement and save-the-day heroics of DeeDee (the dog). If you have followed my blog long you know I love this series. You can see other review of previous books here as well as read an interview with Patrick. I highly recommend the series to anyone, regardless of your reading preferences. The Hitwoman series is truly one of a kind and you will be glad you tried it. When her apartment building is blown to smithereens, bumbling hitwoman Maggie Lee is forced to move back into the Bed & Breakfast she grew up in. Living with her three meddling aunts is bad enough, but it just so happens that the B&B is also occupied by a U.S. Marshal, an FBI agent, her old friend Zeke who’s on a mysterious mission, and a woman who claims she can see dead people. These aren’t the kinds of roomies Maggie wants to spend time with, considering that in order to pay for her niece’s medical care she supplements her income by killing people. Maggie avoids arrest and deals with a crazier-than-usual home life while trying to track down exactly who is blowing up the holdings of various crime families. To make matters worse, she’s walking a precarious tightrope between keeping her mobster bosses happy and protecting her murder mentor (and almost lover) Patrick Mulligan. Aided by the warped predictions of her semi-psychic friend, her sarcastic, demanding, talking lizard and an always ravenous, dyslexic Doberman, Maggie juggles keeping secrets, unraveling riddles and protecting those she loves. Can she do it all? Or will she suffer yet another unspeakable loss? I am so glad you wrote it. Looking forward to the next one!